A busy day for Team Ico at Tokyo Game Show! In addition to confirming Ico and Shadow of the Colossus Collection for PS3, Team Ico also showed off a brand-new trailer for The Last Guardian depicting a variety of real-time gameplay footage. Also, we’ve uploaded new screens of The Last Guardian; click on them to see more. I might as well pre-order it now. I know this isn’t going to leave my radar anytime soon. Sold. Day one and all that jazz. Oh, my God, Sid. That is awesome. Now I’m more curious than ever. If my PS3 still works at the end of 2011 I might pick this up. Way too long to wait but it’ll be worth it. I’ve had this pre-ordered at my local GameStop for months already. This trailer didn’t ball me up in tears like the last one! But im still effin excited to see a new trailer!! wooo 2011 is gonna be a good year! Ico & SoTC & The Last Guardian!! Wow! I can’t wait. This game is going to be beautiful and epic. Thanks for the high quality video so soon after the conference. Looks great so far and I imagine can only get better with the year that the team has to work on it. Whats the word im lookin for…? PHENOMENAL!!! Awww chicken kitty game ,I love you,why must I wait until holiday 2011 to buy you. Can’t wait! can’t wait! close eyes is it holiday time of 2011 yet! I noticed that it said “Family Games” in the “It only does…” part at the end. Is this game intended as a family game? That would be amazing! I love playing games with my daughter, but so many out there are inappropriate for kids. Do you happen to know the approximate age range that this game is suitable for? Man, this game looks really impressive. Like… really really impressive. You guys do know that Q4 2011 is the Japanese release date…right? I really hope it doesn’t take them too long to localize it for PAL regions. @lightyear8: The game might involve Trico killing the soldiers and such, the Japanese title is “Trico, the man-eating eagle” after all, and it’ll most likely incorporate some dark themes to it. This game is probably going to rated T in my opinion. 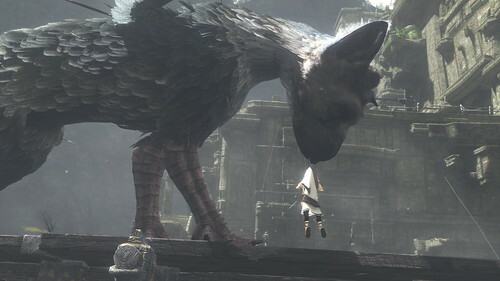 But of course it is possible it won’t involve any killing, none of the trailers actually show Trico killing (all he does to that one soldier in the E3 trailer is shove him aside after all), so you never know. It just might be family-friendly. The map design looks lifted from ico, surely with a huge beast there will be some open world depth like sotc and not linear small ugly repetitive ruins again. I loved sotc and ico but they felt more like tech demos or low budget productions (like portal), with only a few characters and no voice acting and only a few plot points. Was hoping with this would be the full game experience (as portal 2 will be) with more depth and characters and story and perhaps civilization of some kind. Next year is gonna be an awesome year for PlayStation. Better start saving up now. First I wanna say amazing job to the TEAM ICO folks! WOW….the game looks beautiful and whoever did the score for that promo piece NAILED it! The direction they took the emotion of the game was brilliant in my opinion. I wish this was a movie…but better yet, its going to be a game! Also, on a larger note, I can’t believe this far into the life cycle of the PS3 we’re still seeing improvements visually through talented developers like TEAM ICO. Incredible work. This just being my most anticipated game. Ohhhhhhhhhh such a long wait but I just know it will be worth it!!! Can’t wait CANNOT WAIT!!! Tha-rilled beyond belief. I have both games since they came out and can’t wait to dive in all over again in HD. this game might make me cry light a little girl! Wait… Six years of development for a family game? Someone wakes me from this nightmare…! nice great TGS and as i call it…. this is a royal sweep of all the gameshows for PS3 cause we all know this is game of show… and by the way sony….where will you be keeping the 2011 game of the year trophy? Wow, that’s a long time away. But, at the same time.. I can’t wait! I wish they hadn’t even announced it yet, considering how far away it is. It looks like fun to me though.. I really can’t wait. I hope all that time and energy they’ve invested in this game will pay off. my most anticipated Playstation title this entire generation !!!! cant wait to play this Masterpiece !!!!! I love games that offer new experiences and this looks like one of them. Day one buy for me.!!!! looks fantastic, just pure fantastic. like nothing i have ever seen, and i cannot WAIT! i want MORE. thanks for the video, and date though! Best game ever. Calling it now. This and Shadow of the Colossus in 3D, I can’t wait!!! Does this seriously look this good?! This is my most anticipated game with infamous 2 next year! OMG I just c$#@ a little. WOW WOW WOW WOW WOW I CANNOT WAIT TO EXPERIENCE THIS MASTERPIECE! That has to be the best, most realistic looking creature animation I’ve ever seen. Which is kind of bizarre, considering it’s a fantasy creature! Incredible, awesome, even the trailers give me goosebumps… I can’t wait for the finished product! @45 Well Halo, Left 4 Dead, and Gears of War-but the 360 only does shooters. PlayStation 3? It only does everything.